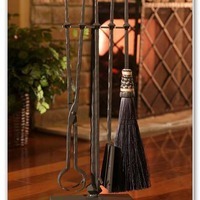 Wrought iron fireplace tool sets are sturdy and stylish, and they work well with almost any color scheme. This season, try adding wrought iron fireplace tools set to your hearth area. The tools will not only help you in maintaining a beautifully warm fire, but will also add to the fireplace décor. You can opt for a small, three-piece tool set or go for a full scale five-piece fireplace tool set that will help you in easy maintenance of the traditional wood burning fireplace. Even if you have a modern fireplace that runs on electricity or gas, adding a stylish fireplace tool set will add to its charm and overall look. 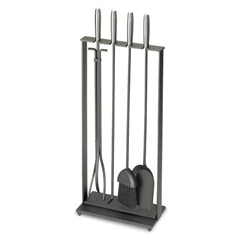 Wrought iron fireplace tool sets come in a variety of designs and looks. From a minimalist design with lean cuts and a modern look to a classically ornate design inspired by the Victorian Era, you can find tool sets to match all sorts of tastes and design inspirations. Most wrought iron manufacturers in the U.S. offer a line of fireplace fireplace toolsets. You can go for a delicate design or a primitive, chunky look. Companies like Napa Forge, Pilgrim Hearth and Enclume Design have a line of fireplace tool sets. Each of these companies follows a different design and look. Moreover, you can find great variety in terms of finish options as well. From the traditional matte black look that never goes out of fashion to classic brass handles, and trendy silver ones, you will easily find a finish that matches your living room and fireplace color scheme to perfection. You can choose a toolset that matches or complements your existing décor. If you are a fan of harmony and perfect matching, you can even bring over your existing wrought iron pieces and get a matching toolset made. You can also opt for a matte black tool set and use it as an accent to your existing color scheme. 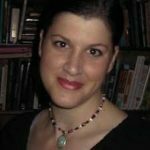 This works well if you have light colored décor in your living room. Matte black tools also look great with pastel tones. Fireplace toolsets also make great Christmas gifts as well. You can easily find the perfect fireplace toolset at TimelessWroughtIron.com We offer designs from all the leading wrought iron manufacturers across the U.S. You can order the toolset online and have it delivered to your doorstep. 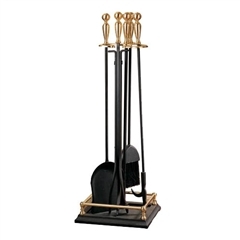 Please visit our website to browse through the entire range of wrought iron fireplace tool sets. You can contact us for further details and ordering info. 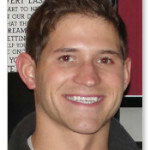 We offer free shipping on orders over $250.